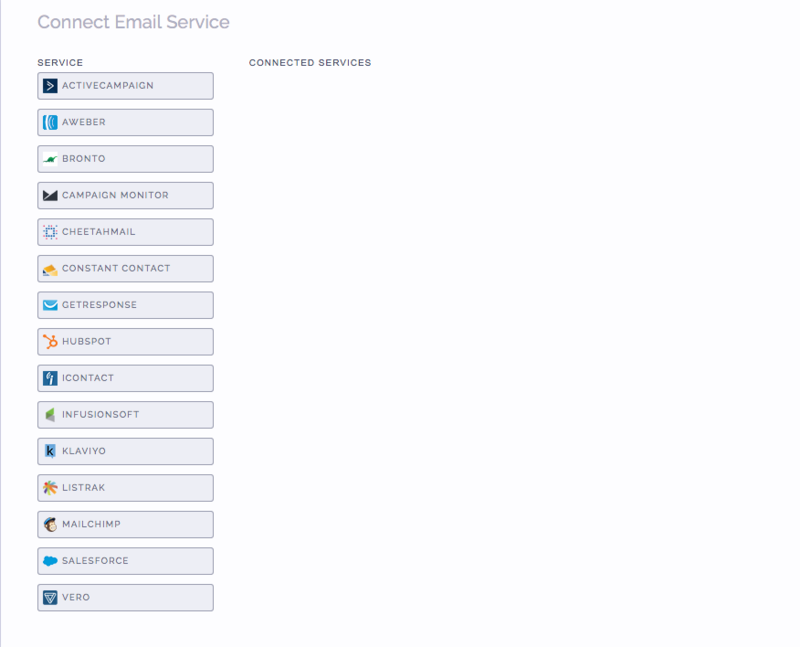 When setting up your campaign, go to the Connect Email Service section and click on MailChimp. Log in to your MailChimp account with your MailChimp credentials. 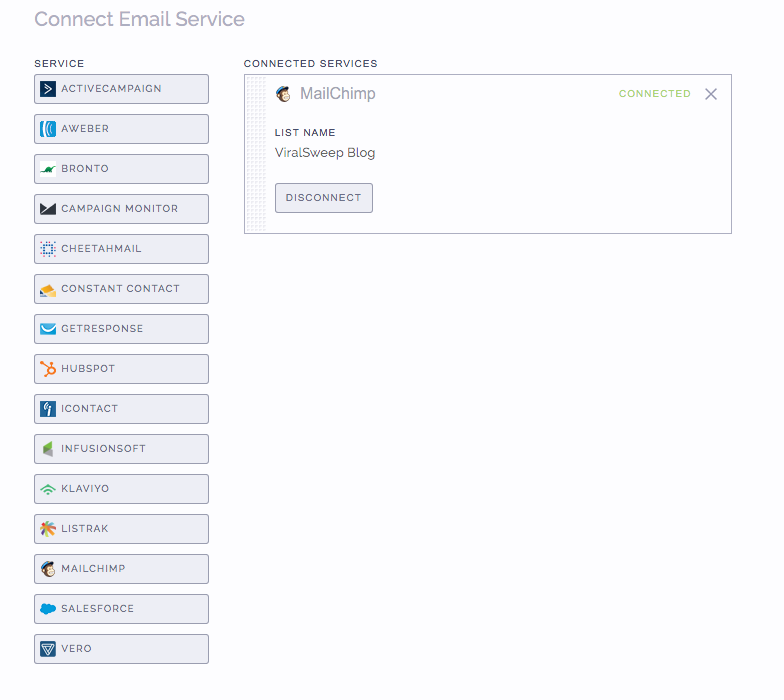 Once you successfully input your credentials and click the connect button, we will reveal your MailChimp lists. Simply choose a list from the dropdown menu and click connect. That's it, you're all set. Your campaign is now connected to your MailChimp account, and we will send any names and email addresses right into that MailChimp list. If your list has some of these fields set to required in Mailchimp, but you don't have these fields added on your promotion in ViralSweep, then emails will not be added to MailChimp. The email address entered into the campaign may already be in your MailChimp list, so it will not be added again. The email address entered into the campaign has already been entered into the campaign previously, so therefore it is not passed to MailChimp. This can happen if you set up your MailChimp integration after you have already entered the campaign. MailChimp is having a delay in reporting. Try checking again in a few hours. MailChimp has the double opt-in requirement in place in order to ensure that you are building an email list of high quality leads that want to receive emails from you. This is a necessary requirement to keep your spam complaints low so that you can have a high delivery rate. The standard double opt-in email that MailChimp sends out is something you will want to tweak in order to have it apply to your giveaway, which will help increase your opt-ins. From here you can edit all the text and colors by using the 'Build it', 'Design it', 'Translate it' tabs. We suggest changing the text of the email to relate it to your giveaway. A good example would be "Thanks for entering. Please click the link below to confirm your entry." Then change the text on the button by going to the 'Translate it' tab and make it say "Click here to confirm entry." You have the ability to disable double opt-in so that email addresses are automatically added to your list without people having to confirm anything. To disable this, simply check off the 'Disable Double Opt-in' box when connecting to a list. You'll want to check to see if the 'Final "welcome" Email' is turned on or off, as MailChimp will send this email out once someone enters your promotion. You can find this email under Signup forms > General Forms > Final "welcome" Email. If you're planning to import leads into an existing list, you may want to create segments to target people who signed up for your list through the giveaway. To do this simply click on your list, then create a new segment. You'll then want to sort by Signup Source > ViralSweep. Check out the example below to see how to do this. 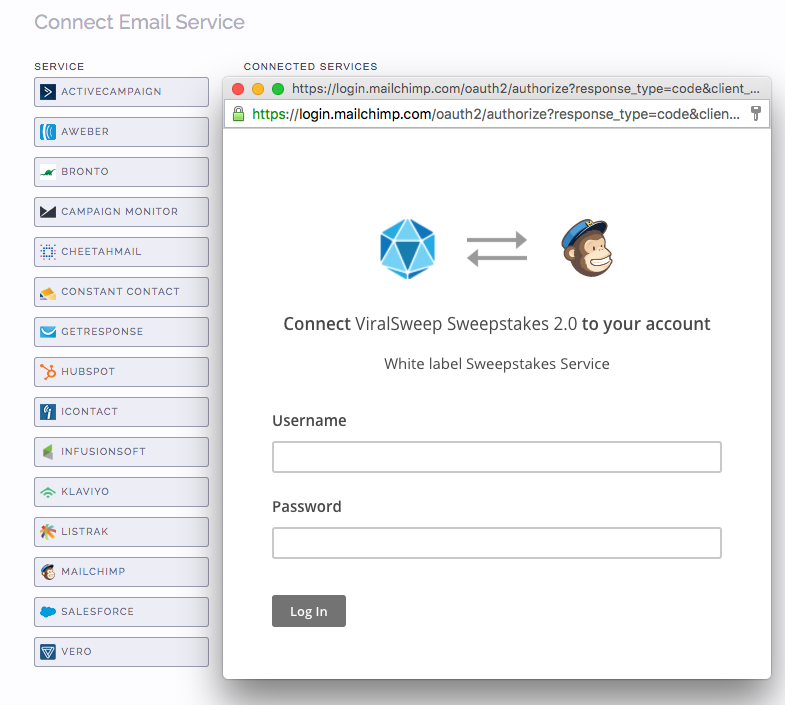 If your giveaway is not connected to MailChimp or no one has entered your promotion yet, then you will not see 'ViralSweep' as a signup source. Still having trouble with connecting to MailChimp? Simply click the support or live chat icon to get in touch with us.